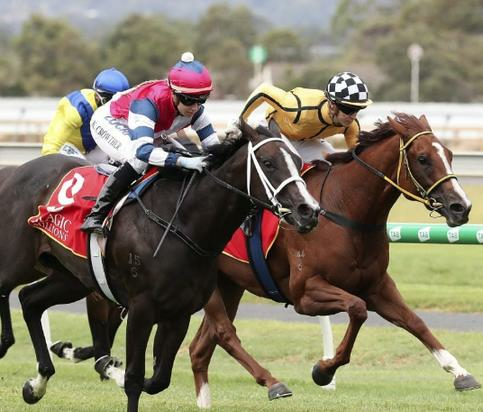 The Adelaide Yearling Sale received the best possible boost on the eve of the 2019 auction with a pair of fillies purchased from last year’s auction dominating today’s $200,000 Magic Millions Adelaide 2YO Classic (1200m) at Morphettville. #Team RBR 2YO Classic runner-up Li’l Kontra was a $110,000 buy in Adelaide last year and has already earned valuable black type for connections including trainer Ryan Balfour. Despite running 2nd at all her four starts she is now a valuable filly after just missing Blue Diamond placegetter Free of Debt at her first start and never being defeated by more than .06 of a length. Ryan said " Despite the frustration of running second our filly has been super and she will only improve. Our owners have $63,000 reasons to be happy , some black type and a Magic Millions day to remember. She is from a family we know so well and we have her and her half sister with breeding lines for the future"
The filly is nominated to race at Morphettville this Saturday and is again drawn to be in the finish.